Many years have passed since I purchased my first carry gun, a used Generation 2 Glock 19. The previous owner had gotten the slide refinished a matte electroless nickel (said to be hard chrome according to the fella behind the gun shop counter) which made it stand out in a sea of black handguns in the display case. The Gen 2’s lack of finger grooves appealed to me since the finger grooves on the “new” Gen 3’s didn’t fit me that well and who needs a fancy rail on the front to carry a light when weapon mounted lights hadn’t really caught on yet. This gun went with me everywhere. Camping, Hunting, Fly Fishing, late nights in rough neighborhoods while working as a locksmith, local practical shooting matches, it could do it all. Sure I had other guns, but none of them could match the concealability and light weight of my trusty G19 while still being large enough to shoot with precision. With its smooth action and unique looks there have been several occasions where other guys at the range made offers in attempts to buy it. All of which I politely declined. It was worn, shiny on the corners, scratched, and dinged with each blemish telling a story of its journey. 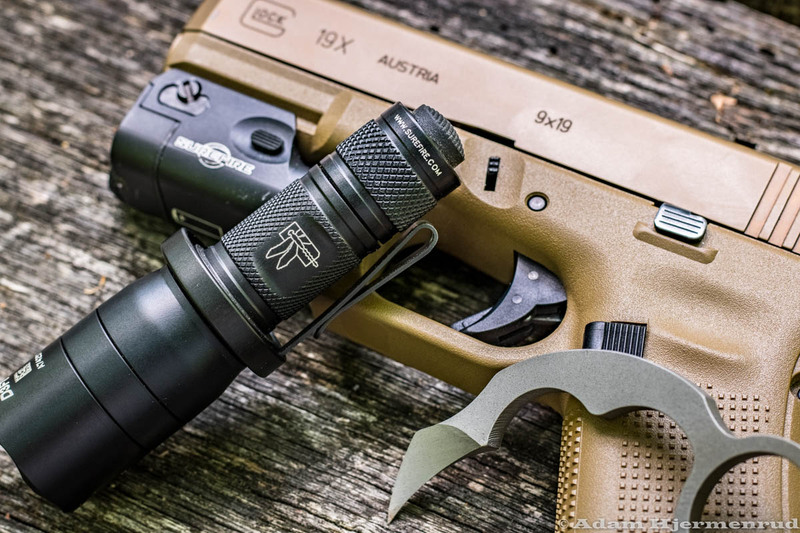 The tritium night sights have faded to a faint glow and can only be seen in the darkest conditions. I knew it was about time to retire this old piece of equipment but it felt like putting down an old dog. With the release of each Generation of Glock handgun I just could not justify purchasing a replacement. Each new release was proceeded with such hype about how great they would be but when I got them in my hands although they were nice and some of the improvements were exciting they weren’t “better enough” to replace my trusty G19. In late 2018 rumors started to circulate the Glock Inc was going to showcase something that peeked my interest at SHOT Show 2019. 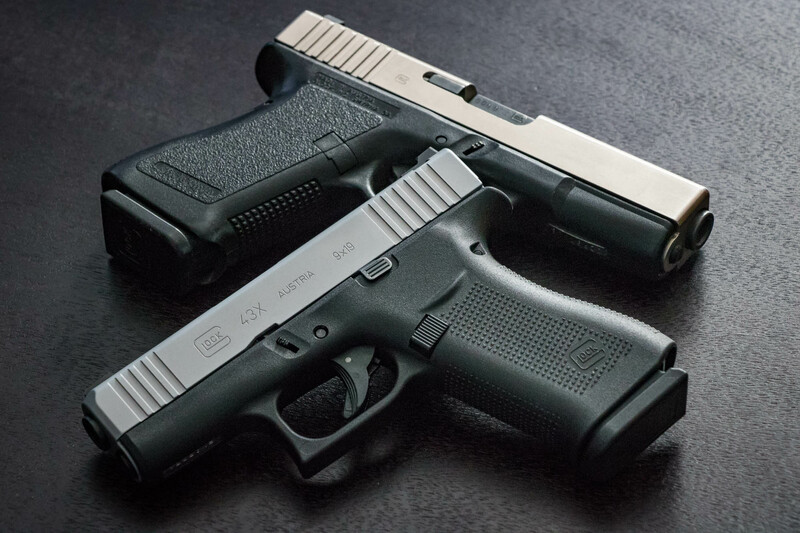 The story was that they where going to release a compact handgun with the thickness and slide dimensions of a G43 and grip length of a G19 and another with the same frame and a longer slide that is closer to the dimensions of a G19. Both new models boasting a magazine capacity of 10+1. My primary objection to the G43 from the beginning was its limited capacity so these new offerings were something to look into. A few days after its release upon reading the specs for both guns I made a decision and picked up my new blaster, The Glock 43X. I chose the G43X simply because it was shorter and fit into the G43 leather that I already owned from my previous test drive. I didn’t see a distinct advantage in having a longer slide on a CCDW gun. After getting my hands on this pistol my initial impressions where quite positive. I found the silver PVD coating to be very aesthetically pleasing and the front cocking serrations are handy for the requisite press check. The grip length being similar to the G19 was very comfortable and albeit considerably slimmer than the grip of a G19 it filled my hand adequately for a positive shooting grip giving the control under recoil of a much larger gun. As with every Glock handgun the sights and trigger needed to be addressed. The sights that came on this gun are the plastic rear with a white “goal post” outline and white dot front that are standard fare for most Glocks from the factory. The trigger pull was tolerable but longer and heavier than I would prefer. Before its first trip to the range I installed a black serrated Vickers Elite Battle Sight rear and Snag Free Tritium front sight from Wilson Combat resulting in a much more clear, functional, and precise sight picture. Purchasing this gun with the intent that it would fill the role of my EDC gun the steel construction of these Wilson Combat sights gave me much more confidence in their durability over the plastic counter parts that were supplied. Next on the list was the trigger. Soon after the release of the G43X and G48 it was announced that the G43 Cary Trigger System from Glocktriggers.com is compatible with these new models making it the obvious choice of replacement trigger. With the G43 Trigger System being assembled using OEM parts and springs I could rest assured there would be no compromise in reliability. After a simple drop in installation the trigger pull was instantly much better. The break was crisp and considerably lighter than the factory trigger. With the reduced pre-travel modification of the G43 “RP” trigger it removed a great deal of the take-up experienced during the initiation of the trigger press as compared to the stock trigger. The difference in quality of the trigger pull after installation was a drastic improvement. Carried securely in a Bravo Concealment holster, the light weight and slim dimensions of the G43X make it a dream to wear all day. With a capacity of 10+1 and a spare magazine I don’t feel that I am at a disadvantage like I do with the lower capacity G43 or J-Frame revolvers. All and all I’m very pleased with my purchase and believe that this little gun, with its upgraded sights and trigger, will find itself on my hip more often than many of the handguns at my disposal. As for my old trusty Glock 19, I suppose it can just retire to a padded top shelf in the safe… for now. GlockTriggers produces the highest quality drop-in trigger systems for your Glock pistol. We use Glock factory parts as the backbone of our trigger systems. Reliability is the reason we begin our process with OEM parts. After hundreds of thousands of rounds and comprehensive research and development we have developed trigger systems that we believe to be the best available. The Edge, Vogel, Skimmer, Guardian and Hackathorn will give you every advantage you need for competition or carry. Everyone who has tested our triggers has been amazed at the quick, clean break and the short reset. 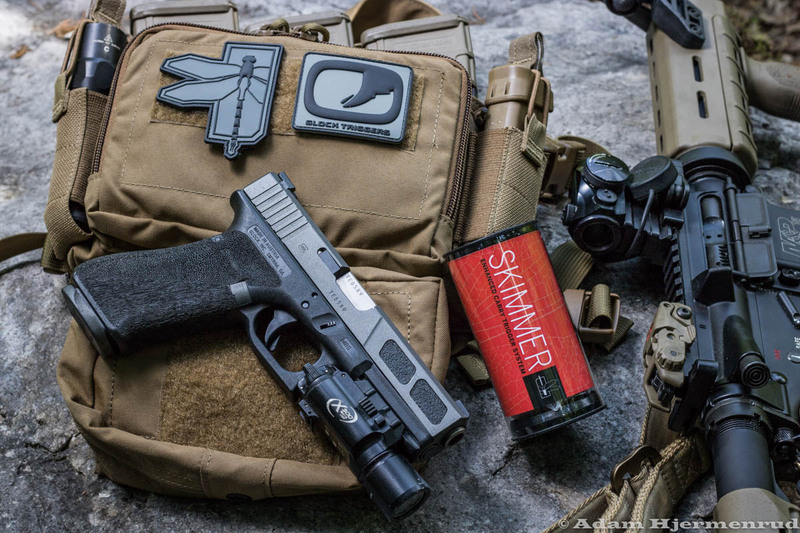 Our products are used by some of the most experienced Glock operators in the Competitive Shooting arena as well as Military and Law Enforcement. We hold up very high standards of quality. We’re all friends that share a passion for the same thing – the shooting sports. And also it’s a creative environment where we’re perpetually trying to make improvements on things. Glock handguns, when they’re manufactured, they manufacture them in such a way to make them extremely reliable, but not extremely user-friendly. We thought, “Well, what can we do to make it better?” On some models, we reduce the travel. On all the models, We polish up all the contact points and make sure that all the pieces are fit properly. We use factory parts because they’re reliable. That is something that is a must. Triggers have to work. Everything is done by hand. Our customers, they span the spectrum, from responsible armed citizens, to competition shooters, to military and law enforcement. And we have models that suit each one of those roles. What we do is we do a complete drop in system using the factory parts. At the beginning of the trigger pull, the pretravel is much much smoother because the interaction of the metal parts have been refined. The overall trigger pull from beginning to end is going to be a remarkable improvement over the stock trigger, but we’re not going to lose the reliability that those parts offer. It’s an easy install drop-in piece, so you don’t have to modify any parts. So what you get with our trigger, is you get a cleaner, smoother, crisper break, with a very positive reset. See our testimonials to learn more about why professionals and competitive marksmen use GlockTriggers as their choice for Glock trigger upgrade systems. Check out all our products here. Many polymer-framed handguns, including Glock, come from the factory with a curved trigger. There is a recent trend to replace this factory trigger with an “after-market” flat face trigger. On a firearm that has a sliding trigger, such as the Model 1911, a flat face trigger can make perfect sense. It allows the same action regardless of where the trigger finger is placed vertically on the trigger. On the other hand, triggers on Glock handguns do not slide directly to the rear like a Model 1911. The Glock’s trigger pivots on the trigger pin and moves in an arc as the trigger travels toward the rear. The front surface of a Glock factory trigger is roughly the same radius as the arc that the trigger swings through as it travels toward the rear. This allows the force exerted on the trigger to remain 90 degrees to the face of the trigger throughout the trigger pull. This provides consistent pressure as the shot is released. On an “after-market” flat face trigger, the angle changes as the trigger swings through its travel. This produces a different angle at the end of the trigger pull compared to the beginning of the trigger pull. We have tested “after-market” triggers from several manufacturers. We have found the results to be mostly undesirable. In some cases, the intended function is compromised. These results are due to changes made by the “after-market” manufacturer and how far they have strayed from the original factory design. Some of these manufacturers claim to be 100% OEM. We assure you that they are not. Glock does not make a flat face trigger. GlockTriggers.com takes pride in offering our customers a trigger produced with 100% OEM parts. This sets us apart in the industry and maintains the legendary reliability that has made Glock such a success. This same standard of reliability applies to all our products and has earned our reputation as an industry leader. Comparing the Skimmer and Guardian Duty/Carry Trigger Systems: Which One is Right for You? Both the Skimmer and Guardian duty/carry trigger systems have been in use by responsible armed citizens and several local and government law enforcement agencies across the country for nearly a decade. For those who go into harms way in order to keep us safe, it is essential that they have the equipment that enables them to reliably and accurately deliver hits when the shot counts. The Skimmer and Guardian duty/carry trigger systems are both manufactured with 100% Glock OEM parts that are refined and polished for the smoothest operation possible and include Glock OEM springs for reliability. While the Guardian Trigger System has the same travel as the factory trigger and is perfect for law enforcement applications where SOP’s dictate that there cannot be any reduction in trigger travel, The Skimmer features a non-adjustable pre-travel reduction modification that eliminates nearly half of the take-up experienced at the beginning of the trigger pull. Our unique pre-travel modification featured on the Skimmer trigger system reduces pre-shot muzzle movement allowing the operator to have greater control and enhanced accuracy. Many of our customers have reported instant improvements in their accuracy after installing our trigger systems, giving them the confidence that they are able to effectively use their Glock handgun responding to the threat with the speed and precision needed in a critical situation. The Skimmer and Guardian trigger systems include a polished Glock OEM ‘minus’ connector installed for a crisp, clean break and reduction in trigger weight. Both models are also available with the option of a 5.5# ‘standard’ connector if the factory weight trigger pull is desired. When the shot counts you can rely on the consistency, reliability, and increase in accuracy offered by The Skimmer and Guardian duty/carry trigger systems. Comparing our Top Competition Triggers: Which One is Best For You? In the quest to find that single piece of gear that will give them that “Edge” over the competition, many of our customers find themselves making a decision between The Vogel and The Edge trigger systems. The Vogel and The Edge competition trigger systems are both produced using Glock OEM parts that are hand refined and polished to a mirror finish. Both trigger systems feature an over-travel reduction modification which can be adjusted by the user with the supplied allen key and a full set of 4.0, 4.5, and 5.0 pound Wolff reduced power firing pin springs allowing you to tailor the trigger pull weight to your ammo and shooting style. The enhanced control and shorter reset of these competition trigger systems will give you the ability to deliver faster, more accurate hits on target. The difference between the two systems is that while The Vogel has the same pre-travel as the Glock factory trigger, The Edge has our proprietary pre-travel reduction modification eliminating nearly half of the take-up experienced at the beginning of the trigger pull making it ready to go as soon as your sights are on target. Both models are approved by USPSA and IDPA for use in ALL divisions and are a great choice for any sport shooting activities. With the reduced pre-travel and adjustable over-travel of the Edge trigger system it has the shortest travel of all the triggers in our line up. Both trigger systems are intended for competition and range use only. Our competition trigger systems are not recommended for duty, carry, or any other critical application. 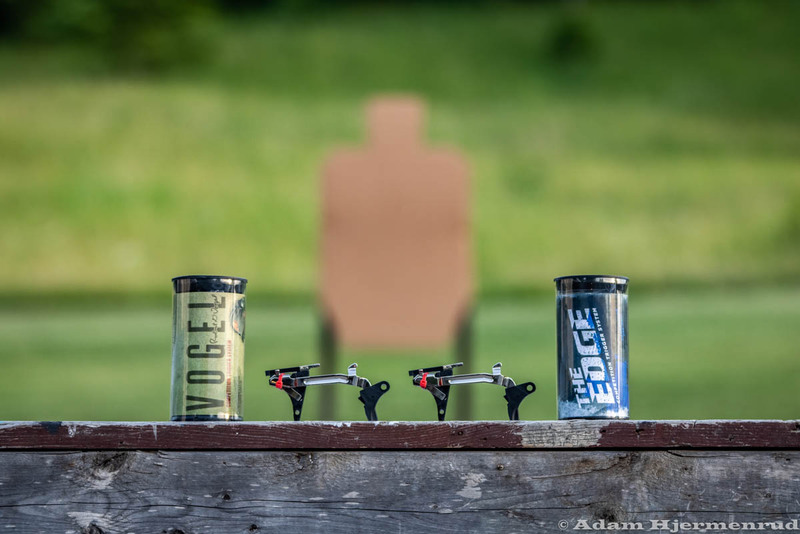 So if you are ready to take your competition shooting to the next level with an increase of speed and accuracy, get your Vogel or Edge trigger system today. “GLOCK” is a federally registered trademark of Glock, Inc. and is one of many trademarks owned by Glock, Inc. or Glock Ges.m.b.H.Inc. Neither Noble Ventures, LLC, Glock Triggers, nor this site is affiliated in any manner with, or otherwise endorsed by, Glock, Inc. or Glock Ges.m.b.H. The use of “Glock” on this page is merely to advertise the sale of Glock pistols, parts, or components. For genuine Glock, Inc. and Glock Ges.m.b.H. products visit www.glock.com.